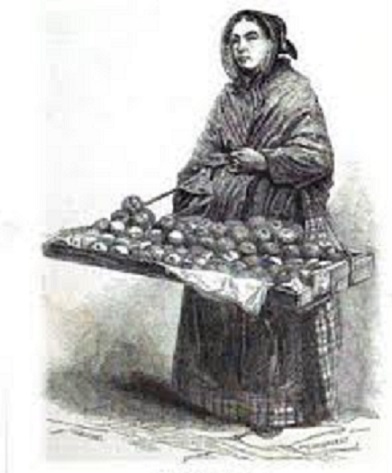 A Victorian costermonger who is also known as coster was basically street hawkers that use to sell fruits, vegetables and other products like fish. They spoke in a loud voice singing song or chant to draw their customers attention and spent most of the time living on the streets. 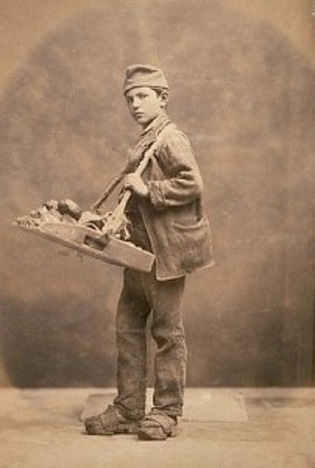 How was the daily Life of Costermongers? 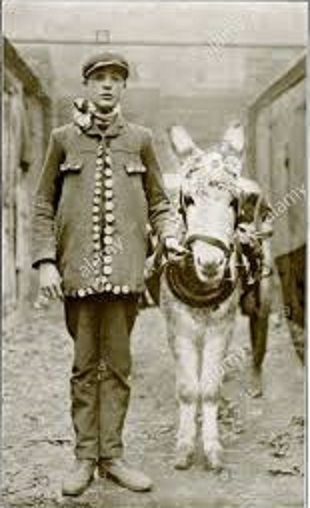 In the 1840’s there were around 30 to 40 thousand costermongers who either resided in London or were traveling to fairs and festivals. 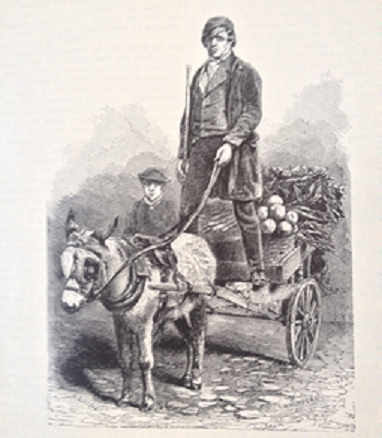 They brought their wares like fruits and vegetables in large quantity and sold them on the streets from their barrows calling the customers to purchase their goods. They provided a valuable service to the poor members of the society who can purchase goods at cheap rates and in small amounts unlike that of stores and shops. They use to sell at a very low price due to tough competition. Costermongers used a language called back slang to communicate with each other and to disguise police and customers. The vocabulary at first looks very simple as the words were just read backward. As an example, the word talk spoken backward would be pronounced as caught but they prefer the use of spelling and used the word klat. Hence this speech was quite confusing and variable. Often extra sounds were added for harmony at the end of the word. Full words were sometimes shortened and they added ‘s’ for plural which further added to complications in language understanding. For instance, the woman in back slang will be nammow while nammows would be used for women. So only untangling the words backward does not translate. Costermongers daily life consisted of selling, gambling, drinking, and theater. If costermongers are not selling their wares they would probably be found at a beer shop, theater or dancing rooms. They also enjoyed sparing and thought themselves to be great boxers. The whole family is included in the hawkers business even children as young as 6 years were sent to work. Girls help in the selling of watercress and flowers while boys help adults with the chanting to attract the customers. Costermongers tried many tricks to make their goods last longer and more sellable. They boiled fruits such as oranges and prunes to make them look juicy and swell. The good quality of apples was mixed with bad ones to bulk out the selling of volume. The same tricks were used with cherries. They tried flattening of weights to make them look larger and also applied false bottoms for the measuring containers. Costermongers are easily recognized with the dress they wore. They use to wear long waistcoats of dark curduroy and pearl buttons of brass or mother. They also wore bell-bottomed trousers along with boots that were decorated with a design of hearts and roses. The important part without which they were never seen was a silk neckerchief which they called as a “Kingsmen”. As costermongers are distinctly identified they hold the prime targets for songwriters as well as for musician. A ballad from London Lyckpeny which was written by John Lydgate in 1409 is an example of music which took its inspiration from the cries of costermongers as they sell cherries and strawberries on the street. By the 18th and 19th centuries, composers and folk song write took their inspirations from the beauty of the women who sold lavenders and other pretty flowers. Costermongers also found its special reference in the novels and plays of the 17th century. In the play of Shakespeare “King Henry IV,” he wrote that in the times of costermongers virtues were of very little regard and their true valor is turned bear heard. Ben Jonson the playwright also mentioned costermongers in his “Epicoene” or “The Silent Woman” that was written in 1609. Many works of the non-fiction of the 18th and 19th century were devoted to the city streets cries. Some of them were pictorial texts that were heavily adorned with lithographs and engravings that depicted the life of street vendors. English painting also undertook the street life and the cries of London as their main themes.”The Victorian Slum ” is a documentary of five parts that was produced by BBC in 2016 which featured a group of costermongers and their families who lived and worked in London.